April is National Donate Life Month, a month dedicated to celebrating the lives of people saved by organ donation and the donors who made a difference. In 2016, over 33,000 lives in the United States were saved thanks to the men and women who decided to give the gift of life. Religion- Most major religions such as Buddhism, Judaism, Christianity, Islam and others are in support of organ donation. Age – If you have been given approval by your doctor to be a donor, you are never too old. The oldest person in the U.S. on record to be a donor was 93 years old. Health conditions- It is important that you do not rule yourself out as a donor due to medical conditions. Each case is different. Premature death- The primary goal of doctors is to save your life. Donation is only considered when all efforts to save a patient’s life have failed. 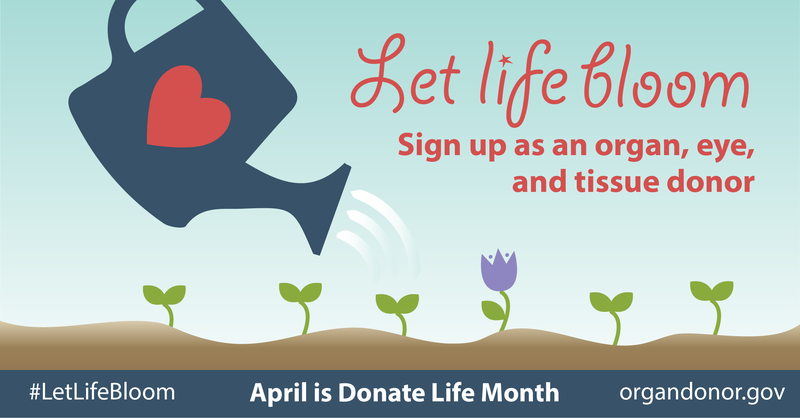 This entry was posted in observance and tagged national donate life month, Organ donation, organ donor by Xavia Malcolm. Bookmark the permalink.